The Faculty of Forestry, University of Toronto, is conducting a research project that is pioneering an innovative vegetation sampling approach and sampling design to monitor natural vegetation in the Lake Simcoe Watershed. The project is undertaken in partnership with the Ontario Ministry of Natural Resources and Forestry (Science and Research Branch, and Southern Region - Aurora and Midhurst Offices) and the Ontario Ministry of Environment and Climate Change. This research project was developed and evolved in response to the Lake Simcoe Protection Plan’s call for the establishment of a natural cover monitoring program for the watershed. The research study will contribute to the development and implementation of the first comprehensive monitoring program for the land-based ecosystems of the Lake Simcoe watershed, and will give us vital information on the biodiversity of the area. The first round of the Vegetation Sampling Protocol was conducted in 2011 on public and conservation lands in the Lake Simcoe watershed. The recent sampling (2014-2016) was aimed at gathering baseline vegetation data across the watershed, including private lands. As of Summer 2016, VSP sampling has involved about 400 crew members, many of which are university/college students or recent graduates. Lake Simcoe Monitoring Report, 2014 (PDF) The Lake Simcoe Monitoring Report (2014) provides the long-term trends of all environmental monitoring programs for Lake Simcoe and its watershed, highlighting current research that informs these trends. The Monitoring Report provides the technical environmental monitoring information for the Minister’s Five-Year Report on Lake Simcoe (2015). For Natural Heritage monitoring see pages 13 to 22. Why is terrestrial monitoring important? By monitoring natural areas, like forests, wetlands, and other natural vegetation, we can learn about vegetation composition and structure, and detect if and where changes occur on a landscape over time. To understand these changes, we need to have baseline information about natural vegetation against which to compare monitoring data. From the baseline condition, changes can be detected and measured, cause and effect relationships understood, trends defined, changes forecasted, and ultimately, timely monitoring information can support informed planning, conservation and management decisions. The current vegetation sampling project is aimed at informing the refinement of the monitoring program while establishing this vital baseline condition from which we can detect and understand how and why natural cover changes over time. The purpose of the Vegetation Monitoring Program is to establish a baseline understanding of the natural vegetation cover throughout the Lake Simcoe watershed, so that we can inform watershed stewardship activities and monitor how this vegetation changes over time. By monitoring the natural vegetation in the Lake Simcoe watershed, we can assess the state of local biodiversity, and detect and monitor changes in natural vegetation (due to invasive species impacts, climate change, land use and development practices, natural cover fragmentation and other presently unforeseen factors). There is currently no monitoring program for the land-based ecosystems in the watershed, and as a result very little site-level vegetation information exists for the area. This project will help establish a baseline so that we can better understand the existing condition of the Lake Simcoe watershed’s biodiversity to detect future changes, allowing us to ensure that natural cover biodiversity and functions are maintained, protected and enhanced. An initial pilot study for the project, focusing on sampling within public lands, was conducted in the Lake Simcoe watershed using the Vegetation Sampling Protocol in 2011. The sampling that occurred in 2014, 2015 and 2016 was in support of the research and included both private and public lands. 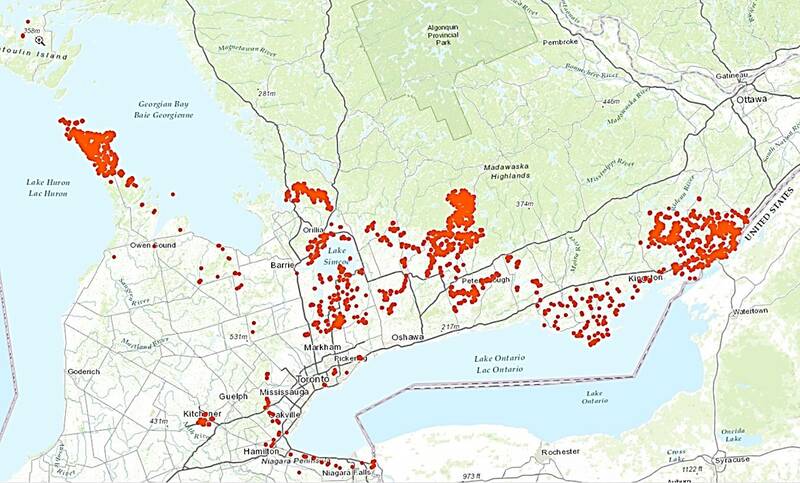 In this second phase of the project, the Lake Simcoe watershed team has sampled vegetation in two general areas with over 500 randomly selected sites from across the watershed. This study uses the Vegetation Sampling Protocol (VSP), a terrestrial inventory and monitoring terrestrial approach that emphasizes data standards, efficiency, and multiple uses for collected information. The monitoring component incudes repeat censuses of individual plants in individual sample plots using standardized methods. Research plots throughout the watershed have been systematically defined, and randomly selected on both public and private lands. Data gathered includes information on vegetation cover, plant and observed wildlife species, forest regeneration, the amount of dead wood on the ground, and soil characteristics. Our data is gathered through observation and minimal sampling, and impacts to the sampling sites will be small, if any. For more information on the Vegetation Sampling Protocol used in this study, click here. In the Lake Simcoe watershed, most of the remaining natural land cover is on private property, and sampling from these areas is therefore essential if we are to obtain an accurate and complete picture of the vegetation cover in the watershed. The support we have received over the years from private landowners has been extremely valuable and we thank all those that have participated. If you are a private landowner who has been contacted about research on your property, please click HERE for more information or visit the FAQ page.